…is our pride and joy. It is large and airy, fully accessible, it doesn’t smell. Unlike a ‘tree bog’ there are no steps AND we get to collect up everyone’s poo to use as fertiliser on the beds. The poo/fertiliser thing will take a number of years. There are chambers -you can see on the photo the access to the front of them The toilet sits on another. When one chamber is full we move the toilet across to the chamber next to it (not visible above). When our wonderful volunteers and visitors have filled that one up, the poo from the first gets shuffled forward with our specially shaped poo spade and we move the toilet back over the first chamber and so on. Only when all both chambers are full will we ‘harvest’ the ‘product’. I don’t know long long this will take or how much we’ll end up with as we’re new to this. But I, for one, am excited. Rest assured for the sake for public sensibilities we’ll only be using this fantastic resource on our flower beds and not on the veg. Please feel free to pop in a contribute any Wednesday! Compost toilet update 06/02/15 – After 3 years the first chamber seems barely a half full! We’re never going to get any ‘hu-manure’ at this rate! I urge you all to do your bit, come to your local community garden and make a contribution. 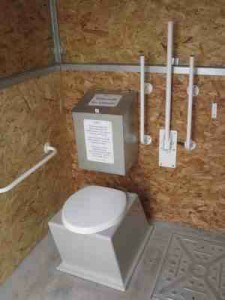 Compost toilet update 14/7/16 – Second chmaber filling up fast. We do so many things with children now in the garden that a lot of more little folks wee ends up in the main chamber, makes things whiff and I have to chuck down heaps of sawdust to try and balance things out. Also the floor need washing A LOT! The Glamour!